NASA/JPL-CaltechAn illustration of NASA’s Cassini spacecraft flying through the water plumes of Enceladus, an icy moon that orbits Saturn. Enceladus is a icy moon of Saturn that hides an ocean and sprays water into space. NASA’s Cassini spacecraft detected gases on Enceladus that some Earth-based bacteria feed on. 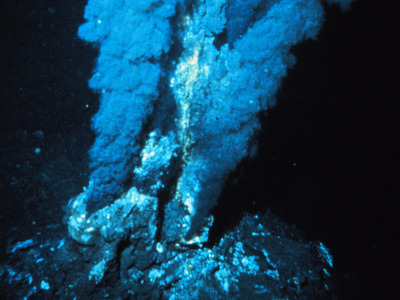 The gases likely come from hydrothermal vents on the seafloor. The discovery raises the likelihood that we could find alien life. If alien life exists, it will likely be found in a place with three main ingredients: water, warmth, and food. Scientists have long thought such conditions may exist under the icy shell of Enceladus, a moon of Saturn that’s about 272 miles (505 kilometers) wide. Those suspicions grew after NASA’s Cassini spacecraft found plumes of water shooting out fissures in the ice. The probe repeatedly flew through the plumes, leading to the discovery of the moon’s global subsurface ocean. But Cassini also “sniffed” and “tasted” the water of Enceladus, and on April 13, scientists revealed they’d found traces of hydrogen and carbon dioxide — two gases that deep-sea microbes on Earth use to feed themselves. A study about the discovery was published in the journal Science, and the space agency shared details about it in a press briefing streamed live via NASA TV. The hydrogen and carbon dioxide gases likely bubble up from hydrothermal vents that litter the dark seafloor of Enceladus. Such vents exist on Earth’s ocean bottom as well — they heat up seawater, react with hot rocks, and leach out food and warmth. “This extensive reaction between the ocean fluid and core should also give rise to the production of hydrogen, which is considered to be one of the most powerful chemical energy sources that could support life activity,” Alexis S. Templeton, a geologist and microbiologist at the University of Colorado at Boulder, told Business Insider in an email. The Earth’s deep-sea hydrothermal vents, also called “smoker chimneys,” are thought to have harbored some of the first lifeforms on the planet. In fact, recently discovered samples date back more than 3.7 billion years. But the discovery of molecular hydrogen, or H2, and carbon dioxide, or CO2, spewing out of Enceladus isn’t smoking-gun evidence of alien life. “They are not saying life must occur, but that there is evidence for conditions similar to hydrothermal regions on the Earth’s ocean floor that host life,” Mark Sykes, director of the Planetary Science Institute, told Business Insider in an email. In fact, Jeffrey S. Seewald, a marine chemist and geochemist at Woods Hole Oceanagraphic Institution, thinks the amounts of the gases that Casini found could be bad news for alien hunters — at least when it comes to Enceladus. At hydrothermal vents on Earth, Seewald said, such hydrogen is rapidly gobbled up by microbes in seawater, making it difficult to detect. NASA/JPL-CaltechAn illustration of Saturn’s icy moon Enceladus, which harbours a subsurface ocean and may have hydrothermal vents capable of supporting alien life. Still, the result is electrifying to many scientists contacted by Business Insider. NAS/JPL-CaltechA photograph of Enceladus, an icy moon of Saturn, taken by NASA’s Cassini probe. One of the study’s big unanswered questions, says Philipp Heck, a cosmochemist at the Field Museum, is whether Enceladus’ water jets are actually a good representation of the makeup of its ocean. 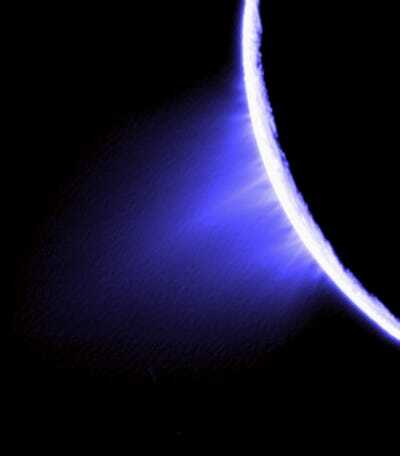 NASA/JPL/Space Science InstituteA false-colour image showing water plumes erupting from Enceladus’s surface. This matters because it makes it much harder to know if the jets sampled by Cassini in December 2015 were representative of Enceladus’ long history. If the mix of chemicals in the jets and the ocean are similar, it’s likely that Enceladus has had an environment that could support life for millions of years. 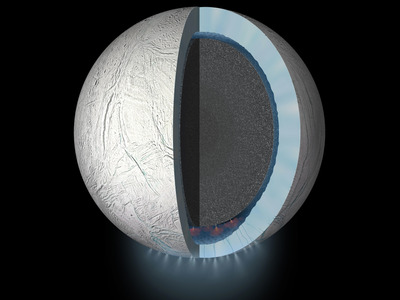 That would also mean that water plumes discovered on other icy moons, like those of Europa at Jupiter, offer ways to probe other hidden oceans. 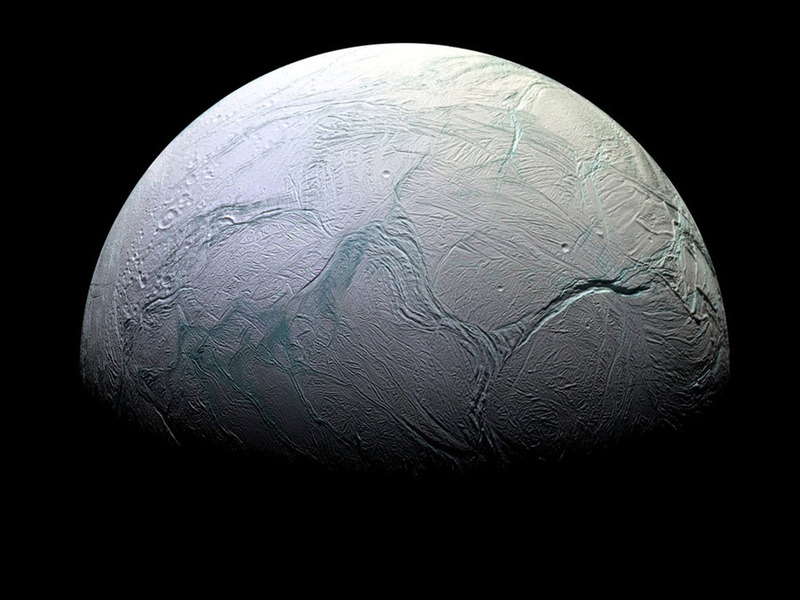 But to truly answer these and other pressing questions about Enceladus, researchers believe we’ll have to launch a multi-billion-dollar mission to that moon, find a way through its icy crust, and get an actual taste of the ocean water there. Some scientists even want to drop nuclear-powered robots into the ocean to map its sea floor, but this could be difficult since the moon’s icy crust is probably 2 to 3 miles (3.2 to 4.8 kilometers) thick. However, the cracks that spew out water from Enceladus may offer shortcuts. “Wouldn’t it be great to dive into those ice fractures with a robotic spacecraft and swim through that ocean?” Hand said.